GMiner is a relatively new Nvidia CUDA miner with closed source and 2% development fee available for both Windows and Linux (64-bit only) compiled with CUDA 9 and supporting only more recent Nvidia GPUs with Compute capability 5.0+ (from the first generation of Nvidia Maxwell-based graphics processors). This miner is focused on supporting different variations of Equihash on Nvidia, so no wonder that it was one of the first to add BEAM support (Equihash 150,5) and is also currently the fastest one for that particular algorithm on Nvidia hardware. Aside from the newly added Equihash 150,5 support, with GMiner you also get support for Equihash 96,5 (MinexCoin), Equihash 144,5 (Bitcoin Gold, BitcoinZ, SnowGem, SafeCoin, Litecoin Z), Equihash 192,7 (Zero, Genesis) and Equihash 210,9 (Aion) and the performance on these is also quite good compared to other alternatives. 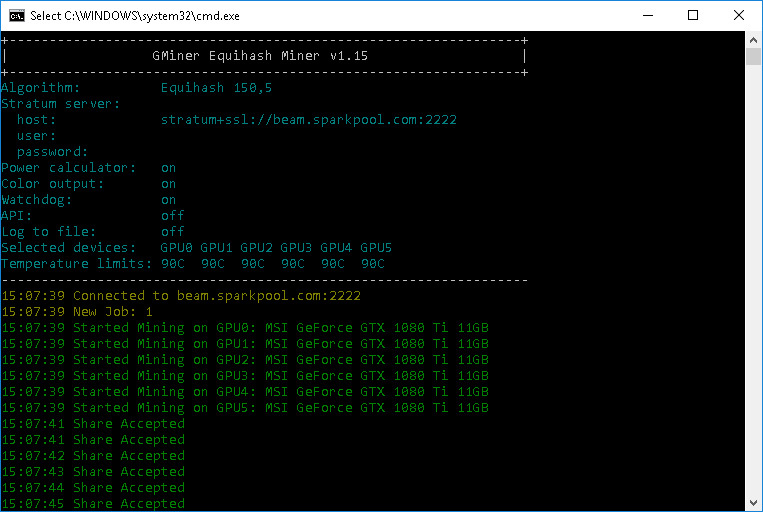 GMiner 1.15 is currently faster than the official BEAM Project CUDA miner as well as faster than the latest Bminer 11.4.0 that also just recently introduced support for BEAM mining on both AMD and Nvidia GPUs, so it is the preffered choice for mining Equihash 150,5 (BEAM) on Nvidia. Furthermore running the OhGodAnETHlargementPill can give you a nice extra boost in performance for miners using GeForce GTX 1080 or GeForce GTX 1080 Ti GPUs equipped with GDDR5X video memory when using Gminer to mine BEAM, so you might also want to give it a try if you have compatible GPUs.